INDIANAPOLIS, Ind. – Webster University's Meghan Illig is a nominee for the prestigious 2018 NCAA Woman of the Year Award, the NCAA announced late last week. This is the 28th year of the NCAA Woman of the Year Award program, which was established in 1991. Illig is one of 581 nominees nationally, which is the most in the 28-year history of the Woman of the Year program and one of 199 nominees from NCAA Division III. In addition, Illig is one of 170 multi-sport athletes that have nominated for this year's NCAA Woman of the Year Award. Eligible female student-athletes are nominated by their member school. Each conference office then reviews the nominations from its member schools and submits its conference nominee to the NCAA. The NCAA Woman of the Year selection committee selects the Top 30 - 10 from each division and then three finalists from each division in September. The Committee on Women's Athletics selects the winner from those nine overall finalists. Illig, who was the only female student-athlete from the St. Louis Intercollegiate Athletic Conference nominated for this award, is a member of Webster's women's cross country and indoor and outdoor track and field teams. During the 2018 outdoor track season, Illig was named the SLIAC Women's Track Athlete of the Year after taking home SLIAC titles in the 100-meter hurdles, 400-meter hurdles and 4-x-400 meter relay and earning All-SLIAC honors in those three events, along with the 200-meter dash and 400-meter dash. 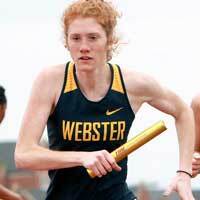 She helped lead Webster to its first-ever SLIAC title in women's track and field. The senior just missed qualifying in the 400-meter hurdles for this year's NCAA Division III Outdoor Track and Field Championships as she fell just short of qualifying as her school record time of 1:02.52 at Missouri S&T's Dewey Allgood Invitational was the 28th-best time in Division III in 2018. In addition to her success in outdoor track, Illig also set four new school records during the 2017-18 indoor track and field season as she now holds seven of the school's all-time indoor track and field records. The record she set in 2017-18 included the 300-meter dash, the 4-x-400 meter relay, the sprint medley relay and the distance medley relay. She also holds indoor records in the 400 and 500-meter dashes and the 60-meter hurdles. Illig was also a member of Webster's 2017 SLIAC Championship women's cross country team. In cross country, Illig was a three-time First-Team All-SLIAC selection and earned two SLIAC Runner of the Week accolades during the 2017 season. In the classroom, Illig carried a 3.93 cumulative grade point average in advertising and marketing and was named a CoSIDA/Google Cloud Academic All-District selection for women's cross country and track and field. Additionally, she is a three-time member of both the SLIAC Fall and Spring All-Academic Teams. The 2018 NCAA Woman of the Year will be announced Sunday, Oct. 28, at the annual awards dinner in Indianapolis.